The Padalily Infant Car Seat Handle Cushion will make traveling with your baby in their infant car seat more comfortable and fashionable . The handle cushion will alleviate your sore arms and give you relief when carrying around that heavy and awkward infant car seat. It also provides great visual stimulation for baby. Some parents have told us baby’s first smile has been to the Padalily! 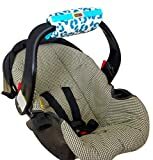 The Padalily’s U.S Patented design features 360 degree cushion comfort, two toy loops and a universal fit for all infant car seat handles; even the triangle handles – simply wrap it below the triangle on the side portion of the handle. Padalilys are made of 100% cotton and thick foam padding for comfort. The B00B87ZZFB8 Lula Leopard is teal and aqua on cream fabric on the front side and a damask coordinate on the reversible side. The Padalily cushion measures 6.5″X 11″ when it is laying flat. It makes the perfect shower gift for any new mom. Wash in warm soapy water and lay flat to dry. Padalily is the winner of the Huggies® MomInspired Grant which recognizes products invented by moms to make parenting easier. Padalily has been the Pregnancy & Newborn Magazine’s Editors pick, and featured in many national magazines and tv shows. Padalily was honored to be on the Steve Harvey show “Mom Inventors” in 2015.